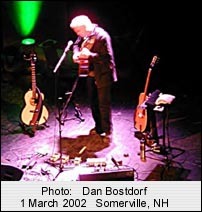 9 March 2002 -- This is the third in a series of fan reports from the current 'Anything Anytime Anywhere' solo tour by Bruce Cockburn. Part III - the Somerville report comes to the project from Reg, one of the Humans, [the largest Internet-based Cockburn discussion forum] and is being reprinted here with his permission. 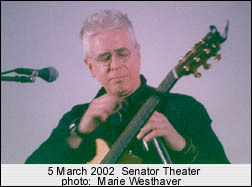 Part IV - the Senator Theater report, comes from a Human and friend of the project, Ruth White. 2 March 2002. You can find this setlist with links to the songs here. Somerville, Massachusetts -- To start with here's a little advice: if you attend a show at Somerville Theatre get there early so you have time to find parking. I dropped my wife off at the front door at 7:30pm. I did not enter the theatre until 8:15pm. I ended up parked illegally about 4 blocks from the venue and jogged to the theatre thinking I was late. As luck would have it Bruce had yet to hit the stage as I walked in. A young man grabbed my hand and in blue marker scribbled a smiley face on the back of it as I strolled through the lobby. At first I was not sure why this was happening and not only was this guy drawing on my hand but he was also making funny noises as he did so. I was not really concerned with what he was up to because I was concentrating on finding my wife and getting inside the hall. Turns out he worked for the theatre and was just marking my hand for readmittance. The Somerville Theatre is a great place to see a show by the way. It's intimate and has great acoustics. This was the second time I'd been there to see Bruce play a solo acoustic gig. The show was sold out. The place was packed and felt all the more so because there's not that much room between seats. The crowd was ready and very vocal, hooting and hollering as soon as the lights went down. It was a theme that would continue throughout the evening as they shouted out song requests (one guy yelled for "Rocket Launcher" just about every chance he got) and sang along to some of the songs. The set-list was pretty much identical to the Keene, NH show with a couple of exceptions. There was a slight change in the running order of the songs ("Waiting For Miracle" closed the first set rather than being an encore for example) and we got not just one new song but two! Bruce played "Put It In Your Heart" and introduced it with the same speech on 9/11 as he'd given at the Keene show but we also were graced with a reading of "Messenger Wind" another brand new song. It's a beauty too. Another minor note for anyone that's interested: The beard is gone. A shimmering version of "All The Ways I Want You" had the couples in the audience cuddling up together including my wife and I. I had sent this song to her on a compilation tape while she was living in Paris and I was here in the states and hearing it really amped up her emotions. This song was definitely a standout for the evening. "Waiting For A Miracle" was given a majestic reading to bring the first set to a poignant close. The second set began the same way as the first with Bruce picking out another echo drenched intro which led into a fantastic version of "Rumors Of Glory". Another highlight of the evening I thought. Bruce seemed to be in a great mood throughout. He smiled, laughed, and responded to the crowd looking very relaxed and at home all the while. The other song highlights were the sing alongs "Wondering Where The Lions Are" and "Peggy's Kitchen Wall", a beautiful version of "World Of Wonders", a fired-up "Let The Bad Air Out" (that even had Bruce laughing a bit during the "Open up the window...let the bad air out" portion) and of course the new "Messenger Wind". Bruce did two encores and finished the night with "Mistress Of Storms" [this may have been "Down To The Delta"] because he said he had no more vocals left in him after giving us the joyous version of "Peggy's Kitchen Wall". This was easlily the best Bruce show I've seen. I really think the man seems to be in his prime right now. He's relaxed and at the top of his game as a performer right now. His voice and guitar playing seem better than they have ever been. It is also my personal opinion that he's writing and recording the best music of his career these days. He just seems to be at a creative peak and has found this great balance in his work. Now what you need to do is go find tickets to see the man on this tour because these shows should not be missed. Let's hope he records some for a live album because it would be a shame not to document these shows somehow. 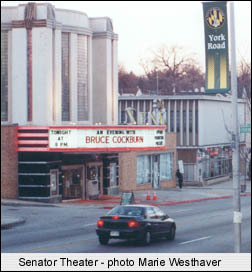 Baltimore, Maryland -- The Senator Theater is huge, we estimated about 500 to 800 seats or more - a lovely old fashioned big movie theatre - that is still mostly a movie theatre and only occasionally has music. The building has lots of history and charm for Baltimoreans. Bruce came out with his winter coat on both times - in the begining and after the break. I think to get on-stage he came in a side door from the outside. This is a movie theatre and he stood in front of a white movie screen - at one point he commented on this, he turned around and looked at it and said something like "I keep thinking there should be big action things up there - like at the drive-in". Scott James, 103.1 FM WRNR DJ introduced Bruce Cockburn as someone WRNR has played for years and will continue to play. The set list (similar to earlier shows) is below with comments - paraphrase of Bruce's and some of mine. "As Scott James mentioned I have a "new" album. It is a collection of old stuff except for 2 new songs. Customarily you put it as a retrospective ..so radio stations will have something to play except for all the songs they never played before, (except for WRNR and too few other stations - there are large gaps out there.) Anyway this is a new title song of the album..."
"I feel like Elvis when I sing this song." "It is hard to do this" (as in move like Elvis) "with this big guitar on". Someone in the audience asked for Silver Wheels, a start of audience requests that built as the concert progressed. Bruce said, "I didn't learn that one this time around but thanks for asking, and here's another travel related song.."
Someone again asked for some love song. Another song request from the audience. 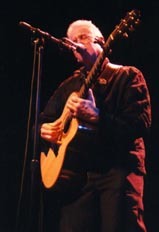 Bruce said, "here's a love song recently recorded by Jimmy Buffet and very sensitively recorded, actually very nice ". Comment: If Bruce felt like Elvis singing When You Give it Away, I felt like a swooning Elvis fan when Bruce sang this song. I did not want the song to end! At one point someone asked him what was on his T-shirt (which had some dark orange and green design on the front). I kept hoping to see what it was. When asked from someone else in the audience, he showed everyone, it is a big green bug, and he said he did not know what that meant.. probably no meaning, but I wasn't the only curious one. "Here's something that's very new. I found myself watching TV like everyone else on Sept 11th, and I thought how pathetic to address something like that with a song. But after the next few days, I thought there is not a much better way to address that - to help us put that in perspective. This song helped me (get perspective) maybe not directly, but I wouldn't have written it without (the events of Sept 11th). A friend of mine said if we are going to have a war about anything, we should have a war on fundamentalism." I heard song after song this night that Bruce wrote over many years, that combine so poignantly an image of violence and an image of either almost religious ecstasy or personal love, in the midst of what seems real and awful. In, Wondering Where the Lions -- there is the image of "Young men marching, helmets shining in the sun" and then "eternity, some kind of ecstasy" the absolute joy of life and hope instead of despair and fear of Armageddon. And in many songs, he turns to someone and affirms his love, on a very personal basis in the midst of all this. I thought about how I heard Bruce play this last at the Institute for Policy Studies - it brought back memories of that wonderful benefit concert night. A great sing-a-long and Bruce seemed to enjoy that part! Request from audience. And Bruce encouraged the audience to sing and they did. here is bigger than you can imagine.. 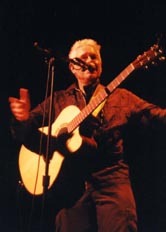 Someone also commented on his guitars, he said 2 were Manzers made by Linda Manzer of Toronto and the 3rd is a 12 string from the 70's his girlfriend gave him. And this is a place of happenings, as I left the theatre last night a seemingly "impromptu" and very lively drum concert was going on in the lobby tempting people to stick around after the show. Everyone was lovely, friendly. But when I was here before Bruce was here with a back-up band and the mood seemed livelier - you wanted to get up and dance. This concert was better from my humble perspective, and deeper. There was no dancing impulse. I just wanted to sit and hear Bruce and his guitar for ever. Driving home listening to the new CD AAA (after dutifully listing some to WRNR the concert hosts), AAA seemed to loud, and I resented the arrangements I thought incredibly beautiful before. Now I wanted the spare and preferred beauty of just his voice and guitar. I must say, from where I sat in the 3rd row the sound was wonderful! 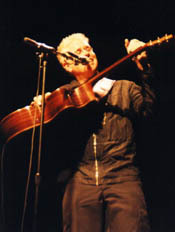 I did sit in my chair and wish the Bruce Cockburn concert would go on forever, but that didn't happen, and here I am sitting at my computer writing about it!